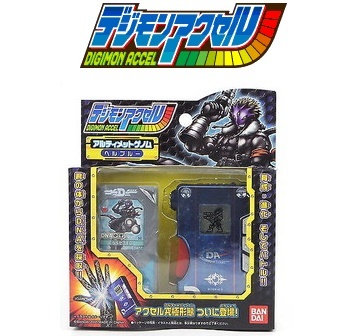 The Digimon Accel (デジモンアクセル) is a Digimon virtual pet with features like the Accel Grip, the Matrix Sensor that can scan DDP chips as well as your hand. It features the three-pronged connector, and a removable face plate allows you to change the paper skin underneath. Digimon Accel Ultimate Genome (デジモンアクセル アルティメットゲノム) is the third wave release of the Digimon Accel Virtual pet. Kyaromon: Machine/Mutant 0-5, Beast 6-10, Holy 20. Kyaromon: Holy 0-5, Machine/Mutant 11-15, Beast 20. Kyaromon: Beast 0-5, Holy 6-10, Machine/Mutant 20. Kyaromon: When you do not fulfill the requirements of other Digimon. Dorimon: Machine/Mutant 0-5, Holy 6-10, Beast 20. Kudamon: Water 0-5, Dragon 11-15, Holy 20. Palmon: Insect/Plants 0-5, Water 6-10, Beast 20. DORUmon: Water 0-5, Beast 11-15, Bird 20. Impmon: Insect/Plants 0-5, Bird 11-15, Dark 20. Candmon: Dragon 0-5, Machine/Mutant 11-15, Dark 20. Impmon: Bird 0-5, Dark 0-5, Insect/Plants 20. Palmon: Beast 0-5, Water 11-15, Insect/Plants 20. All Child Digimon: When you do not fulfill the requirements of other Digimon. Candmon: Dark 0-5, Machine/Mutant 6-10, Dragon 20. DORUmon: Water 0-5, Bird 11-15, Beast 20. Reppamon: Machine/Mutant 6-10, Dragon 11-15, Holy 20. Flare Lizamon: Insect Plants 0-5, Dragon 11-15, Holy 20. Submarimon: Dark 0-5, Water 11-15, Holy 20. DORUgamon: Beast 6-10, Machine/Mutant 11-15, Dragon 20. Devidramon: Insect/Plants 0-5, Beast 11-15, Dark 20. Togemon: Dragon 0-5, Insect/Plants 6-10, Beast 20. Submarimon: Holy 0-5, Water 6-10, Dark 20. Reppamon: Machine/Mutant 0-5, Holy 6-10, Dragon 20. Flare Lizamon: Insect/Plants 0-5, Holy 11-15, Dragon 20. Togemon: Insect/Plants 0-5, Beast 6-10, Dragon 20. Devidramon: Dark 6-10, Beast 6-10, Insect/Plants 20. Flare Lizarmon: Holy 6-10, Dragon 6-10, Insect/Plants 20. Togemon: Dragon 6-10, Beast 11-15, Insect/Plants 20. Reppamon: Dragon 0-5, Holy 11-15, Machine/Mutant 20. Devidramon: Dark 0-5, Insect/Plants 11-15, Beast 20. Submarimon: Dark 0-5, Holy 6-10, Water 20. DORUgamon: Dragon 0-5, Beast 11-15, Machine/Mutant 20. All Adult Digimon: When you do not fulfill the requirements of other Digimon. DORUgamon: Machine/Mutant 6-10, Dragon 11-15, Beast 20. Tyilinmon: Beast 11-15, Dragon 11-15, Holy 20. 80% or more Win Ratio. Piccolomon: Machine/Mutant ?, Water 11-15, Holy 20. 60% or more Win Ratio. DORUguremon: Beast ?, Bird 6-10, Dragon 20. 60% or more Win Ratio. Cerberumon: Bird 6-10, Machine/Mutant 11-15, Dark 20. 75% or more Win Ratio. Pumpmon: Machine/Mutant 6-10, Insect/Plants 11-15, Dark 20. 60% or more Win Ratio. Tyilinmon: Holy 0-5, Beast 11-15, Dragon 20. 75% or more Win Ratio. Cyberdramon: Water 0-5, Dark 11-15, Dragon 20. 60% or more Win Ratio. Delumon: Insect/Plants 0-5, Bird 11-15, Dragon 20. 60% or more Win Ratio. When you do not fulfill the requirements of other Digimon. A 1 hour transformation after the use of Leo Cap. A 1 hour transformation after the use of Giga Lance. A 1 hour transformation after the use of Rival Past. Through the use of Chaos Boost. DORUguremon: Bird 11-15, Dragon 11-15, Beast 20. 80% or more Win Ratio. Scanning: There are 2 functions in scanning using the Matrix Sensor. Digimon Command: You can view your Digimon’s data here. Digimon: Here, you can view your Digimon’s Name, Age, Weight, DNA Type, Level, Attribute, whether you can Battle and Jogress, the Hunger Status, the Strength Status, the DP (Digimon Points) Gauge, the Win Ratio, X Points (If you win a battle against a Pendulum X, the X Point Gauge will go up by 1), and DNA Code (the Digimon’s data in numerical form). X Points: Battle with the Pendulum X and if the Pendulum X is at the Perfect or Ultimate level, a victory will give you one point (two points if you win by a Tera Hit). If you are a Perfect or Ultimate Digimon when the gauge is filled you will evolve into Omegamon X (Justice Genome), Dukemon X (Evil Genome), or AlforceV-Dramon X (Nature Genome). In the Ultimate Genome, this is replaced with Mini Points, and the points are obtained by battling with a Digimon Mini; this unlocks Dorumon’s line. Training Command: This is where your Digimon will train. A successful training session will increase your Digimon’s strength naturally. Before battle, you are shown the Accel Bar, which is a bar graph you can increase by continuously pressing the Accel Grip. By doing this, you will increase the number of times the Digi-Core revolves. This is shown by the RPM counter. If you stop at a certain position when doing so, you may be able to Blast Evolve. Unlike the Pen X 3.0, your Digimon stays in the same form, but its appearance changes to make it look more menacing. Blast evolution uses 30 DP and only occurs at the Perfect and Ultimate stage. Your Digimon’s attack power will double, and the Hyper Hit becomes a One-Hit-Kill. Now, there are two options here as well. Normal: This training will be similar to the Pendulum Progress and Pendulum X series, continuously press the accel grip and the RPM counter will determine your points in a series of 5 shots. The structure is as follows. It is required you get 5 Points or higher to increase your Strength hearts. A series of 5 sequential Double Shots earns you a “Mega Hit”, a series of 5 Triple Shots will get you a “Giga Hit” and a series of 5 Hyper Hits will earn you a “Tera Hit”. Training will decrease your DP level. When DP is depleted, you will not be able to train or battle. Quest Mode: In this method, you battle opponents throughout a 4 area map, each with 10 Digimon to battle. Victories and losses are both counted. You have 10 bars of health. A Single Shot will remove 1 bar of health, a Double Shot 2 bars, a Triple Shot 3 bars, and the Hyper Hit 4 bars. You will face a preprogrammed set of enemy Digimon, which can be viewed on the Quest Mode section. Each enemy Digimon drops an item when defeated. You can choose any of the 4 areas at any time and fight the sequence of 10. Care Command: Here, you can wipe the screen clear when your Digimon poops and turn the lights off when your is ready to sleep. A full 8 hours’ sleep is necessary to refill the DP Gauge. Battle: You are able to battle Digimon Accelerators and other three-pronged pets. You can only use a weapon when battling against Digimon Accelerators. Trade: You can trade items with other Digimon Accelerators. Jogress: Jogress your Digimon with other Digimon Accelerators. PAUSE OPTION: Unlike previous V-Pets, the Digimon Accelerator has no Pause Option. Like the D-Scanner, The Digimon Accelerator has a save function. It will automatically save when your Digimon evolves so you are able to “load” the data back if you happen to have to change batteries. So you can just stick the plastic tab back in to disconnect the battery if you are not going to use it for a period of time. The Digimon will reset to its state at the time immediately following its last evolution.